Jan. 18, 2019, ©. Leeham News: We have now covered the basics of pitch stability for an airliner and how a stable or unstable pitch moment curve looks. Now we look at different trouble areas. Straight and stable pitch moment curves are difficult to achieve at all flight situations. We will discuss some well-known problems, how these were detected and what the solutions were. Flight situations with disturbed pitch stability. 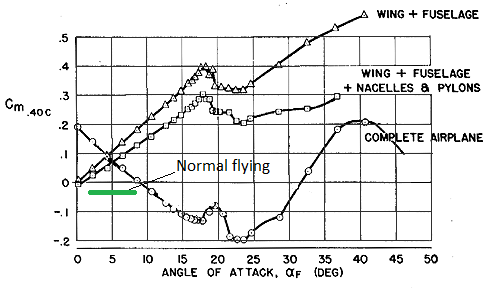 Figure 1 shows how a DC-9 candidate tested in the wind tunnel entered two pitch up situations when the Angle of Attack (AoA) went over 18° and then again over 24° (the complete airplane curve with the two areas of a positive angle of the curve). When this happens a deep stall can occur. A deep stall is a stall which cannot be exited with a normal elevator down (stick forward) command. 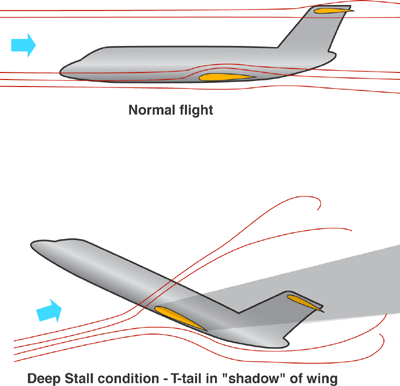 The problem is common on T-tailed aircraft as the horizontal stabilizer sits high enough to be in the wake of the wings stalled (and by it turbulent) air at stall Angles of Attack (AoA), Figure 2. Figure 2. Horizontal stabilizer in shadow of wing causing deep stall. Source: Wikipedia. The problem is common for T-tailed aircraft and was discovered when testing the first such aircraft in wind tunnels and later flight tests. The first T-tail airliners were Hawker Siddley Trident and BAC-111. By the fifth stall test with a BAC-111 with an aft Center of Gravity, the pilots took the aircraft too far into the unstable curve past stall and the aircraft’s elevator no longer had the necessary lift force to get the nose down. It was operating in a too disturbed air coming off the stalled wing. The BAC-111 remained at a stable AoA of over 20° until it hit the ground from 17,000ft. After the BAC-111 crash, it was decided to spread the findings of the crash to all competing aircraft projects to avoid a repeat of the accident. The solution became a combination of stick shaker warning of the approach to stall and then a stick pusher triggering just before stall AoA is reached. By it, the aircraft never enters a pitch moment region with a positive angle of the curve. The shaker/pusher combination is since fitted to all airliners and business jet aircraft which has such a deep stall pitch characteristic, mostly T-tailed aircraft. These aircraft shall not fly beyond the AoA of the stick pusher triggering, as recovery is not guaranteed. Many military aircraft have a worse pitch moment curve than in Figure 1, often without a stick pusher. Examples are the F104 Starfighter (which had a pusher) but also the F16. One of these I flew, the SAAB Draken. We trained to enter deep stall and how to get out by forcing the aircraft even deeper into the stall. The aircraft then started oscillating in pitch at AoAs of 20° to 50° and by increasing the downgoing oscillation we could swing ourselves out of the stall. The F16 uses the same tactic to exit its deep stall. The cause of the deep stall for the F104 is the same as for the DC-9/BAC-111 but different for the Draken and F16. These have a highly swept forewings, called the strake for the F16 and the forward delta wing for the double delta Draken. When the main wing stalls, the forewing is still giving lift and the center of lift suddenly moves forward. This bends the pitch moment curve upwards and the stabilizer/elevator is overpowered (the elevons on the Draken). The F16 subsequently got a larger Horizontal stabilizer making the deep stalls less common. The F16 Fly-By-Wire has a special direct mode to let the pilot swing the aircraft out of a deep stall in the same way the Draken’s classical “Fly-By-Steel-Wire” allows the pilot to use the stick to swing the aircraft out of the stall. In the next Corner, we will look at further cases of disturbed pitch moment curves for airliners and gradually approach the problem areas of the 737 MAX. What’s happening at 18 degrees? It looks like some kind of change in the aerodynamics of the wing that shift the center of lift aft, or on the elevator, produces less force at 18. What outside forces would pitch the aircraft up from stable 8 degrees to 18? Some upward gust on the front or a downward gust on the elevator? The diagram in Figure 1 is from a test in a wind tunnel where a model of the aircraft is put on a sting and forced to gradually pitch up over the AoA range. The sting is equipped with a force balance which draws the diagram you see in Fig 1 ( Sting with balance ). So it’s no force from the elevator which causes the increase in the AoA in this artificial case. What the test gives is the natural pitch moment curve of the projected aircraft (with some caveats). The bump in the pitch moment curve at 18° is the onset of stall on the main wing. This sends a disturbed air stream to the horizontal stabilator which no longer has the same force to keep the nose down. Between 20°- 23° the pitch up force of the nose stops as the airflow no longer can follow the front of the fuselage (see part 2). This gives temporary relief but then shadowing of the tail is total from 23° and the pitch up into deep stall is manifest. The Saab 35 Draken should have needed a Mig-21 type of flying elevator to get good elevtaor response at all speeds. Now Saab compensates on the Boeing T-X with huge flying elevators placed at max distance from c.g. The Handley Page Victor was a large T tailed aircraft flying from around 1956, seems strange that the deep stall problem wasnt picked up then, even on wind tunnel testing. Even the Lockheed Starlifter large transport was in design and testing from late 50s-early 60s. Regarding the Lockheed C-141 Starlifter and deep stalls, see the excerpt below from page 7 of the 1969 NATO technical report at the link after the excerpt. C-141 first flight was on 12-17-63, after the BAC-111 deep stall crash on 10-22-63. “On Friday the 23rd March 1962, Victor XL159 left Boscombe Down for further low-speed trials. The crew consisted of the Handley Page test pilot Philip Murphy (28) the A&AEE pilot, Flt. Lt. Waterton (30), the Navigator Michael Evans (26) and two Handley Page Flight Test Observers, John Tank (25) and Peter Ellwood (23). At about 1.30 p.m. the aircraft was at 15,000ft. over Lincolnshire carrying out trials with the gear and flaps down, in Philip Murphy’s hands. Control was then passed to Flt. Lt. Waterton to continue the programme. The F-101 Voodoo had a pitch-up problem caused by the T tail also. We lost a couple in the UK in the early 60’s. In on series they took the F-4 to 110 degrees (yep, past straight u) then spun it. It was the most insane gyrations I have ever seen an aircraft (or much of anything else doing) , tumbling, twisting, in all 3 dimensions. They started at 35k I believe, if you had no recovery by 10k you bailed out! Not much discussion that night, just sort of stunned and amazing.